1.How To Reset Password on Hikvision Camera or NVR? We often get asked how to reset passwords on either an NVR or IP Camera. 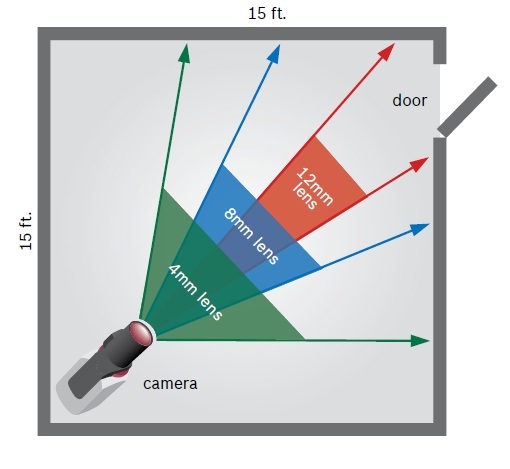 The following quick guide by Hikvision takes you through the steps to do this. You DO need to download the latest SADP tool from Hikvision. We can only reset passwords with Australian region codes/serial numbers. We can only reset passwords for Hikvision devices purchased through us. If you purchased your equipment through another re-seller we suggest you contact them for your password reset. 3.Which Lens Should I Select? 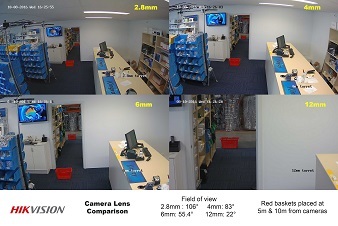 One of the difficult problems when setting up a CCTV system, is choosing the right lens for your cameras as different lenses give different fields of view, and different levels of zoom. 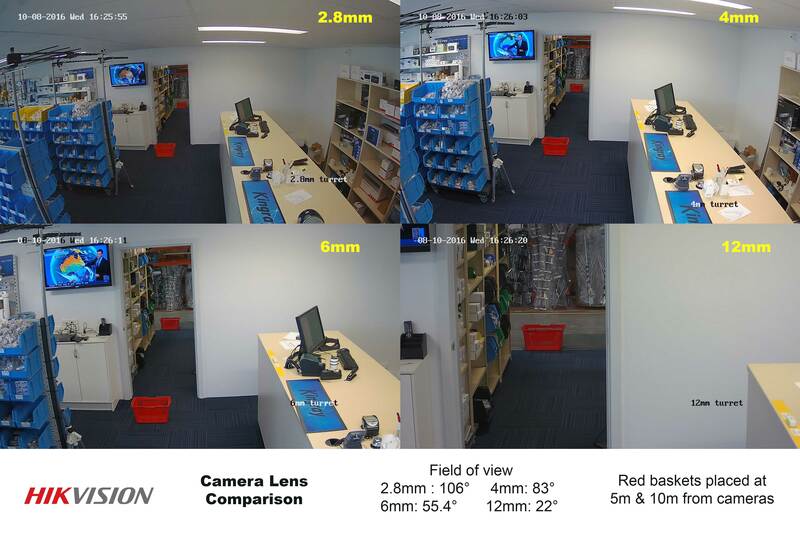 If you have security camera in the office or home and you want to see as much as you can, you should go for 2.8 or 4 mm lens (makes a wider view). 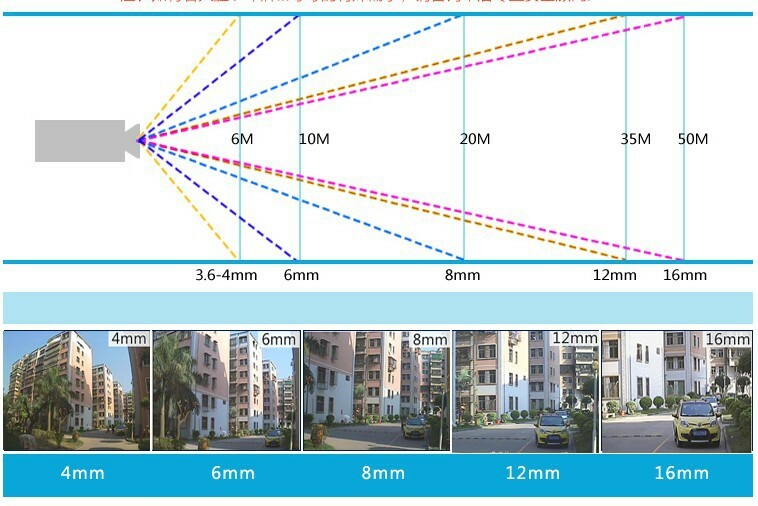 If you want to observe a limited area, like an entrance you should go for 6mm or 12mm (makes a narrow view and objects are closer). 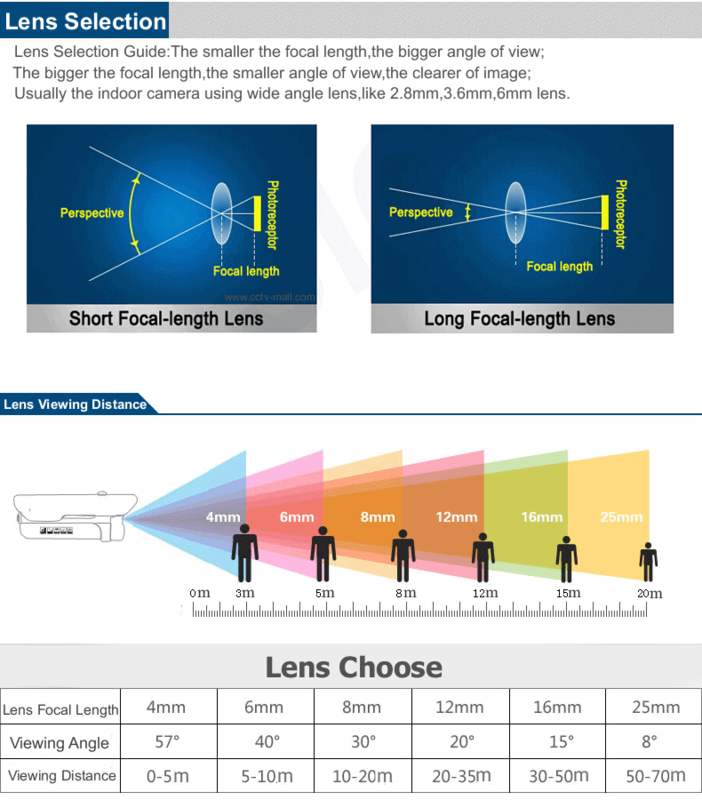 If you are not sure of which lens, then choose a vari-focal lens camera (ie 2.8mm - 12mm maunal or motorised zoom) so you can adjust the field of view once the camera is mounted into position. 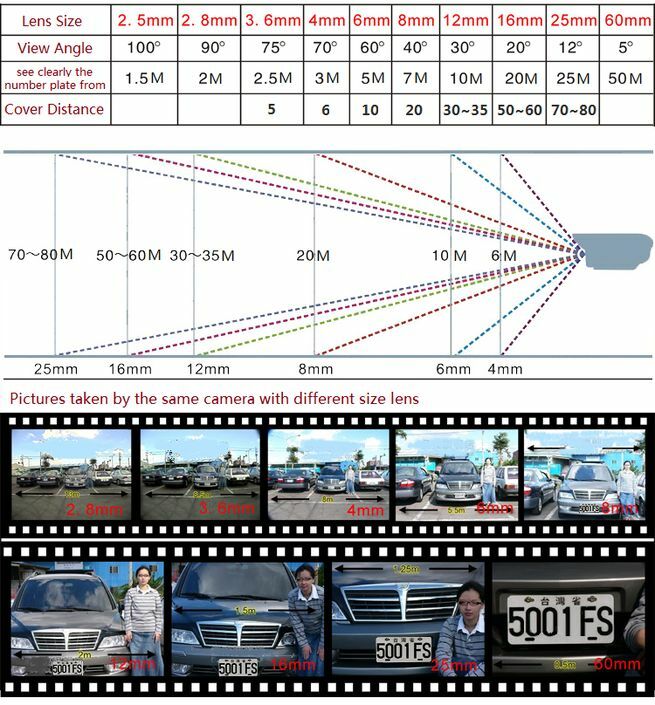 The following images are designed to be a guide to assist you in selecting a camera lens size for your installation/application. Please contact us if you require additional information or assistance. 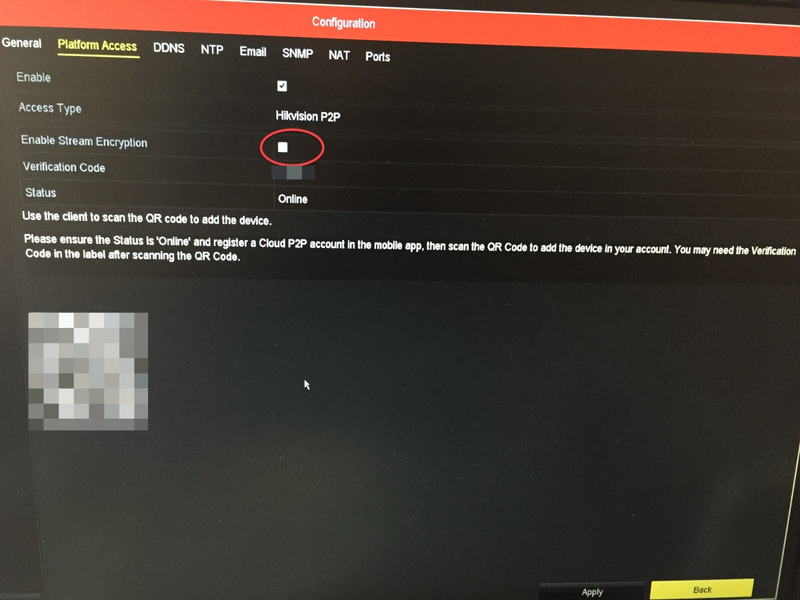 The below document contains steps to check when the Hik-Connect service shows OFFLINE on your NVR or camera. * We only provide support for DIY Security Cameras customers. * The above document is general in nature to assit with troubleshooting. * We are unable to check or validate any Hikvision service or status. * We do not know why your connection goes offline. * If you need additional support we suggest contacting your place of purchase. 1. Supports adding devices via Cloud P2P without registration. 2. Supports sharing devices with others by scanning his/her QR code in visitor mode. 3. Supports changing user type from visitor to official user by registering via email address or phone number. How to guide on upgrading your visitor mode account to a registered Hik-Connect account. 1.Do you sell genuine Hikvision Cameras and NVR's? Definitely !! We source our Hikvision products from Hikvision's official distributor in Australia, so you can rest assured that these are the genuine product. All Hikvision products purchased through us come with a full 3 year warranty. Special Order items are those items that are not stocked by us or the distributor and have to be specially ordered in from Hikvision. Lead times can vary but generally it takes between 3 to 4 weeks for a special order time to come into the country. Note: Special Order items cannot be cancelled once an order has been placed. 1.Where do I download the iVMS software? 2.How to Fix Stream Encryption Errors on Hikvision iVMS-4200 Client. Ever received those "stream encryption" errors on Hikvision iVMS-4200 client when trying to view cameras via the Main Live View screen. the "encryption key" needs to be entered for each camera. We have put together a video blog post to show you how to fix this error. The iVMS-4200 client for MAC does not support entering the "stream encryption" key at time of writing. 3.How to Fix Stream Encryption Errors on Hikvision Web Interface. Ever received those "stream encryption" errors or a "blank screen" when viewing cameras via the Hikvision Web interface? This is usually caused by enabling the "stream encryption" option on your NVR. 1.Should I use Cat5e or Cat6 Cabling? We often get questions from customer's about what Ethernet cable they should use when planning their IP camera installs. They ask "should we use Cat5e or Cat6 and whats the difference?" 1. Cat 6 cable has more stringent specifications for crosstalk and system noise than Cat5e does. That means you'll get fewer errors on a system operating via Cat 6. 2. Cat 6 cable is full-on certified to handle Gigabit speeds. 3. It's also suitable for any 10-Gigabit uses that may come along, thus future-proofing your cabling now and well into the future. Cat5e can successfully be used with your camera installation. 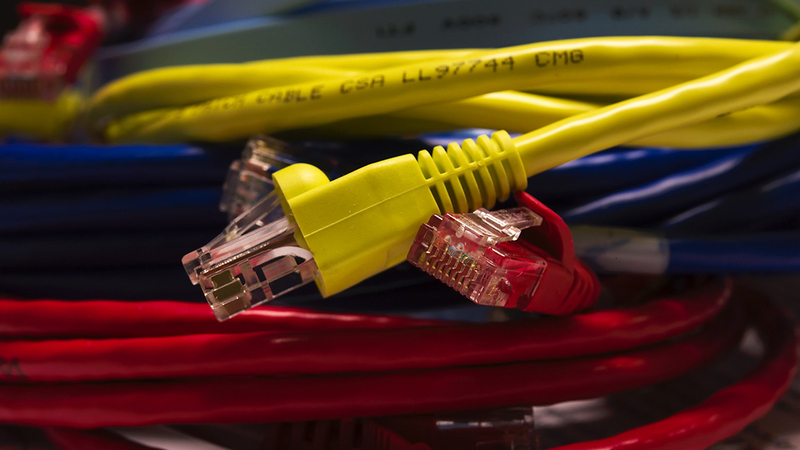 Cat5e cable is enhanced to reduce interference so that it can reliably deliver Gigabit speeds, however, Gigabit ethernet pushes the cable to its limits. If you are starting your camera installation from scratch and what to future-proof your cabling in your home or office then Cat6 cabling should be your prefered choice. 2.What do the IP and IK camera ratings mean? Ever wonder what those IP and IK numbers are that are mentioned on camera datasheets. Well wonder no more, here is a detailed explaination of what they mean. 3.What is Hikvisions H.265+ technology? Here is a Hikvision article which talks about their H.265+ technology. 1.What is Hikvision Camera's Default IP address? 2.What is Hikvision Camera's Default User Name and Password? 1.How Do I Change a disk drive in a Hikvision NVR? 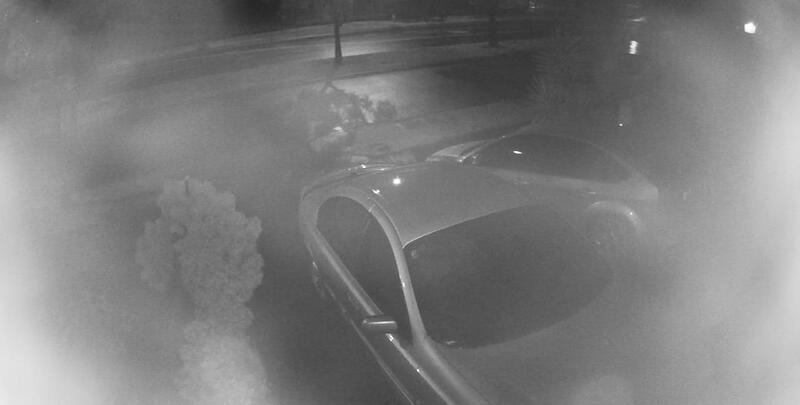 With dome cameras night time images can appear blurry or foggy due to dirty/greasy dome bubble, reflection from nearby objects or loose foam ring around the camera lens. Hikvision has produced the following document to help troubleshoot and solve these issues. 3.Why is my NVR/DVR beeping? To fix the issue login via the DVR/NVR local interface, go to Menu / System Configuration / Exception. Go through the list of exception types and select each exception type and un-check AUDIBLE WARNING if it is checked for that exception. 1.How Do I Activate a Hikvision Device? New Hikvision devices (ie IP cameras (IPC), PTZ cameras, digital video recorders (DVR), and network video recorders (NVR) with the latest firmware (IP cameras from 5.3.0, DVR/NVR from V3.3.0) no longer have a default password. When using the device for the first time, users need to activate the device through a compulsory password setting. The following is a quick start guide for users on how to activate the device. 2.How To Reset Password on Hikvision Camera or NVR? 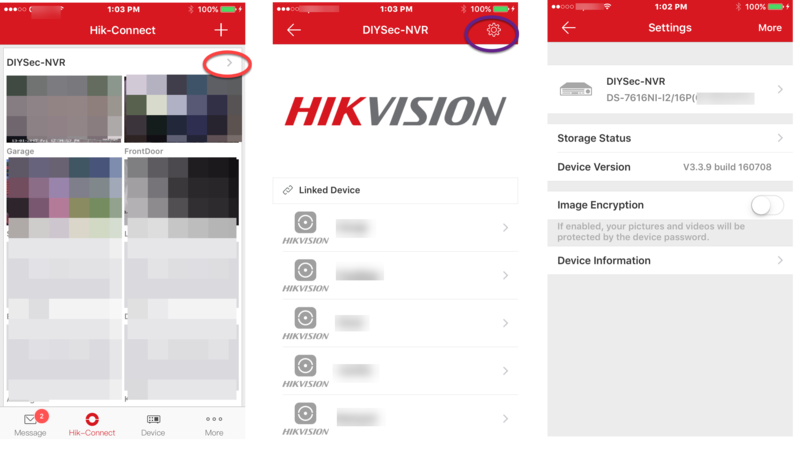 Hik-Connect is a new service introduced by Hikvision which integrates the dynamic domain name service (HiDDNS) along with alarm push notification service. It provides an easy way for devices to connect to the Internet. Hik-Connect's P2P functionality allows connections outbound from your device (NVR/Camera) to the Hik-Connect service for alarm push notification and Live View. Using the Hik-Connect P2P service eliminates the need to setup complicated inbound port-forwarding for customers on their Intertent routers/modems. The following is a guide for users to add their devices to the Hik-Connect service. 2.How To Add A Device Into Hik-Connect? 1.Where Do I Download Mobile Client Apps? You can download the mobile client apps from either the App Store or Google Play Store. Please visit our DOWNLOADS page where you will find links to each mobile application. When using the iVMS-4500 mobile software to connect to your NVR, there are several reason why "Connection failed Error Code: 8200" is displayed. 1. Incorrect network configuration of the device. However we have recently found that enabling "stream encryption" on your NVR will also cause the "8200 connection error". This option needs to be turned off if you are going to the iVMS-4500 mobile software to connect remotely to your NVR. 3. Uncheck "Enable Stream Encryption"
1. Open up Hik-Connect App. 4. Turn off "Image Encryption"
1.How Do I Obtain Hikvision Latest Firmware for my Camera or NVR? Please login to your customer account and click on the "My Firmware" button. This will display our firmware download page. 1. 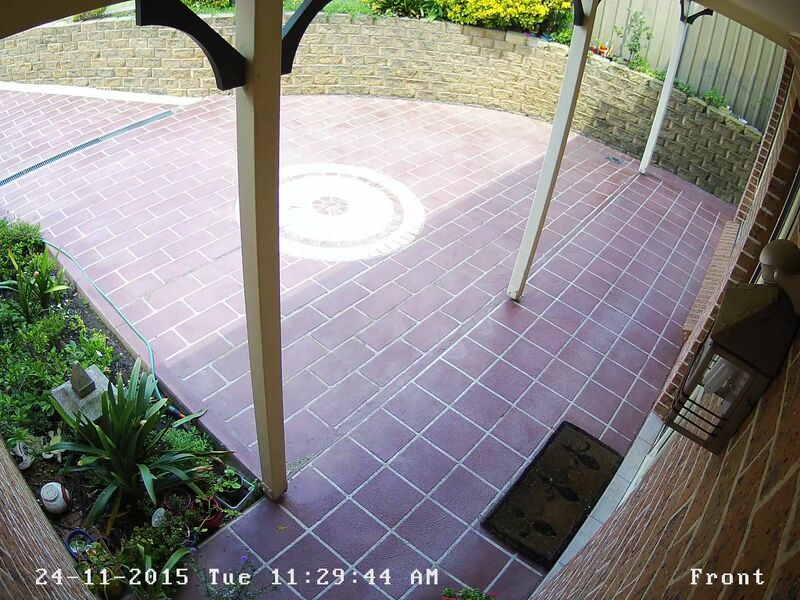 Click on the "DIY Security Cameras Download Portal" button. This will take you to our hosted downloads page. 2. Navigate to the firmware that that you require, download the .zip and save it on your local drive. 3. Extract (or unzip) the firmware file from the .zip usually by "double clicking" the .zip file and saving the extracted file to your local drive. 4. Please take note of any readme and any special instructions. We have Video Upgrade Guides in our Blog section to assist you throught the upgrade process. Any firmware download from overseas sites MAY NOT be compatible with the Australia region’s firmware. If installed it could render your camera/NVR product unusable and possibly void warranty. 2.All Hikvision 5MP cameras are now capable of 6MP with latest firmware. All Hikvision Easy IP 5MP cameras purchased from 20th April 2018 will ship with the default resolution set to 6MP. Existing customer who wish to take advantage of the new 6MP resolution need to upgrade to the latest baseline firmware (v5.5.3 Build 171018) which is available under your Account after logging into our site. If you are connecting the newer 6MP cameras to existing/older NVR's then may need to upgrade to the latest NVR firmware release, which is also available under your Account after logging into our site. 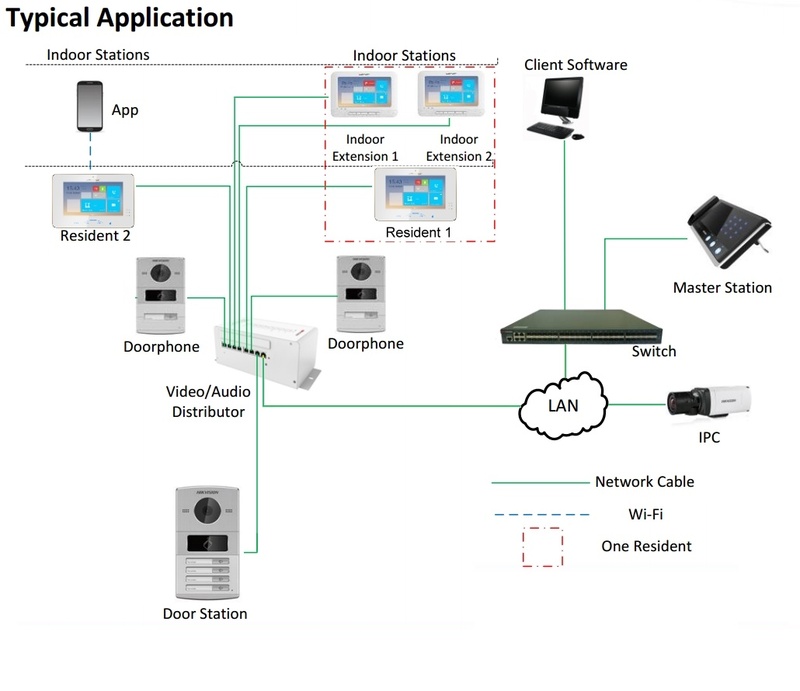 1.Typical IP Video Intercom connectivity guide. The KAD606-P/612 are video/audio distributors and provide power and network connectivity to the individual intercom components over a single ethernet cable. The KAD606-P/612 also include two cascading LAN interfaces to connect to existing network infrastructure (ie switches, adsl/cable modems etc) to provide Internet connectivity if required. You can also power the indoor stations and door stations using 12vdc (2 amp) power supplies.